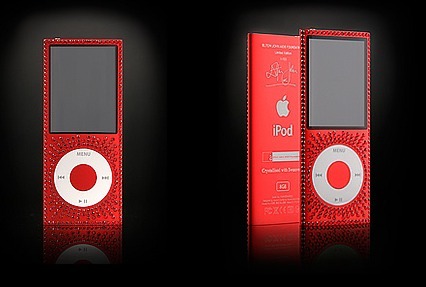 Out to give the rumored MySpace MP3 player a run for its money, Elton John has launched his own iPod nano lineup, raising money for a charity close to his hearts and our own -- the Elton John AIDS Foundation. Taking his cue from the classy 'n' sassy Swarovski crowd, the players are bedazzled in the aforementioned crystals, and are available in black, green, orange, pink, purple, red, silver, or yellow. Available at Goldgenie and Selfridges, the 8GB version is going for £399.99 ($566) while the 16GB model will set you back a cool £449.99 ($638). Be sure to jump on this soon, as each color is only offered in a limited edition of 100. And if that weren't enough, Goldgenie is throwing in "Rocket Man: The Definitive Hits CD" with every order. More pics after the break.